You might think you're buying quality chicken. But can it sing rousing renditions of "Don't You Want Me" by the Human League, "Sister Christian" by Night Ranger and "Africa" by Toto? Didn't think so. Foster Farms chicken can, though, judging by the comical new spots below from Goodby, Silverstein & Partners, which has been injecting humor into the injection-free poultry brand since 1993. This is indeed, as the tagline says, "Amazing chicken." "These are songs that get stuck in your head," says GSP executive creative director Margaret Johnson. "And these spots are just little fun nuggets to remind you of the brand. Yeah, I said nuggets." The agency's work on the brand, including the famous "Foster Imposters" chicken puppets, has always illustrated the benefits of "Always fresh, never frozen" chicken. This work, though, quietly introduces new Foster Farms frozen chicken—which the agency, after doing consumer research, says isn't incompatible with the brand at all. "Consumers were smarter than we were and knew that if it came from Foster Farms, frozen wasn't going to be a second-best option—it was just going to be a first choice made more convenient," says John Thorpe, director of brand strategy at GSP. "People are smarter than agencies." 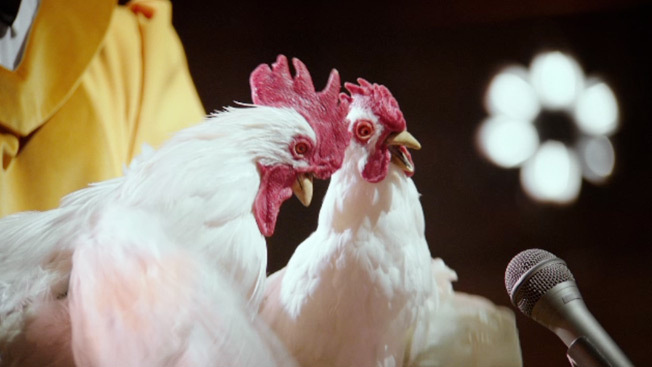 The three spots below, somewhat reminiscent of Camilla and the Chickens from the Muppets movie, were directed by Ben Gregor of Knucklehead and edited by Kim Bica of Arcade Edit. They broke today online and will air on TV soon in the brand's western U.S. markets.